My first evening meal in London this trip was on Bierodrome (Horrible website, BTW. Flash, hard to navigate, and impossible to link to the specific place I’ve been to inside the general site) in Kensington St. next to the Holborn Underground station. The reason for selecting it was quite simple. Location. It was late at night, on the street I had to take from the musical I just saw to the Underground station, and I was after a sleepless night because of the flight. So since it looked alright from the outside I decided getting in would be preferable to starting to wander around the area looking for another place. I entered, stood by the door, and looked around. There was a large bar in the middle and to the left of the room, a few tables (some occupied) on the two walls nearer the door, and an area with smaller tables across the room. The important thing is that there were tables, and there were a few waiters walking around. So two options, either I needed to sit down and wait for a waiter to arrive, or I needed to wait for a host to bring me to a table. But there wasn’t any potential host or hostess standing near the door, or was there a sign asking people to wait to be seated. After a few more seconds during which none of the waiters looked to my direction, I decided I should probably sit. So I did. Not the right decision, though. It took a little while, but I figured out that nobody is coming with a menu. I stood up, and started walking across the room to the other side, where a waitress just passed. And was surprised to see that in the corner of the area on the other side of the bar, the one across the room from the entrance, and which is hard to see well from the entrance given the muted lights, there’s a hostess stand. And the expected sign of waiting to be seated. The smaller tables were the restaurant’s, and the larger ones were for the bar, and probably intended for patrons to come and get their own drinks. Fine arrangement for returning customers who know the place, very silly way to organize a room where new clients may stray in from the street. Once there the waitress/host approached me, and I asked for a table. I sat down, and received a menu. Or maybe there was a menu at a container on the side of the table. I think both, she probably gave me the food menu, but alcohol menu was there. I don’t exactly remember, and it doesn’t really matter. For the food I took their Sausage Platter. It’s been a while since I ate sausages, and the raw materials seemed interesting. Pork and leek sausages, Wild boar in Chimay Beer (whatever that is) sausages, and Chicken with sun-dried tomato sausages. A platter of three types of sausages meant one sample from each kind. More would have been better, but I can’t say I was surprised. The sausages themselves were good, though. All three. Though there were differences in quality, with one just being nice, and one being really good. Not sure which was which, since the spicing blurred the flavours of the listed main ingredients, but if I had to guess I’d say the best one was the Wild Boar and Chimay Beer sausage. The “Belgian Mash” on which it was served was dull and unimpressive. The “Forest Fruits Juice” seemed to be mostly cranberries cooked until they started to become soft and slightly saucy, but it was good, and add flavour to the mash. For a drink, given that I was in a pub, and they had a wide selection of draft beers I wasn’t familiar with, I decided to try the beers. An experiment that went on throughout my short stretch in England, ordering a different kind of beer with (almost) each meal. The most interesting one on the menu was a St-Feuillien Blonde draft beer, so I ordered a pint. It was the most expensive beer they had on the menu, but also sounded like the one I have the least chance of trying elsewhere. And it was really really good. The taste was more sweet and delicate than the beers I usually drink (Though usually may be too strong a word given that I don’t really get to drink beer much), but very tasty and easy to drink. And, I think, better than the other kinds I got to try later on. Overall the place seems really nice, the interior design is comfortable and gives it a good atmosphere, and the food has potential. They just need to work a bit on the service, both to actually pay attention to people coming through the door, and on the general attitude (While my waitress did everything she should have had, she didn’t even bother faking being interested or caring much). My first lunch in London was in a Hamburger Union. One of the two branches they have in the West End, but I don’t quite remember which one. As it was the first day, I was still in a state of being appalled by the extremely high prices of nearly everything in London, food included. The prices are significantly above those I’d pay around here for similar things. Actually, it’s pretty well known that the prices are above what most people anywhere on the world will pay, but there’s a difference between knowing somewhere is expensive, and actually forcing yourself to pay money for something you’re used to value for less. It takes quite a while to get used to the fact, and to really feel comfortable with the notions that these are the prices and nobody is trying to rip you off on purpose. Though, given the fact that the Soho, and most of the West End, are big tourist attractions, I suppose it’s also possible that to some extent everyone actually was trying to rip everyone else off. And then I saw this Hamburger Union, which while definitely screamed Fast Food at least looked nice and respectable. And their prices, at least the burger prices, were high but not as insane as most everything else around. The first room is small, and basically just has a copy of the menu, and the counter for ordering. After placing the order I got a numbered card, and was directed to the next, and bigger, room with the tables. I picked a table, and placed the card in the holder. Which was a bit more complicated than it sounds. I mean, the system is simple enough, there’s a small stand and two edge grippers you can put the card in. But the shape would be perfectly suited to holding just a single bigger card. And so far most places where I encountered such a system had a card per table, since two strangers usually didn’t share a single table. And so I wasted some time trying to figure out how to use the entire holder for my card, before it dawned on me that I only needed to use one side of it. My order, a burger with cheese and bacon, arrived after about a minute or two. They do have dishes beyond burgers, but given the name of the place, and the price issue, ordering a burger seemed like the thing to do. The burger itself was a bit on the small side, but very good compared to my expectations from a fast food burger. The cheese and bacon were also nice, and blended in well. The bun was obviously not mass-produced. Which had the disadvantage of it having a really weird shape (someone spilled some dough when putting it into the oven), but the advantage of it not being the tasteless mushy thing that was also a part of my expectations. So that’s a clear win. Since, as I said, I was still in price shock, I didn’t try any side orders. One thing on the menu surprised me, though. They have “Protein Style” burgers, which are the same burger except that it comes without a bun, and wrapped in lettuce instead. More like no-carb style than protein style, since no extra protein was added. But they’re priced the same as the regular burgers. Vegetables too were more expansive in England, but I’m sure a lettuce leaf costs a lot less than a bun.I don’t know, for a Brit it may make sense, paying the same for the burger since he only eats the burger, and not wasting a bun. But from the perspective of an Israeli this is extremely rude, as people are asked to pay the same for getting less. Never mind that the target audience for this won’t use the extra, they still pay for it. Many would explicitly opt to take the regular one and leave the bun uneaten. Overall, not exactly gourmet food, but it was quite nice. These were taken on the same day, all in a very small area, so despite the lack of any other connection thread I’ll group them here for simple geographical reasons. The first photo is of the Royal Opera House (Which is also the home to the Royal Ballet). It looks much more impressive in real life, but it’s hard to get a good angle to shoot better pictures. I didn’t go inside, and I didn’t see any show that they had there. Just an outside look, and an impression that it may be worth visiting some time. These are from the Broad Court street area. The area had some very nicely designed street lamps, and of course those still common quaint red phone boxes. I found the last lamp amusing, with what seems to be a vertically standing fluorescent bulb, exposed and unadorned. On the same street as the rest of these designed lamps, and with its electrical cord dangling the way it is, it presents a somewhat jarring image. Also on the same location was this nice statue of a young dancer. The plaque doesn’t mention any specific reason for it being there, or what was the reason for commissioning it, so I don’t know. Wasn’t critical at the time, and doesn’t bother me enough to actually try and research now. It looks nice, and adds some charm to the area, so I guess it does its job. The only thing I don’t like about it is that this explicitly labelled young dancer was actually sculpted sitting. Instead of, for example, in the middle of a dance. Oh, well, artistic taste. These are from the Freemasonry Grand Lodge of England Library and Museum building. The building itself is impressive, but then again plenty of the old buildings in the area are, so that doesn’t necessarily mean much. Not having much to do with the Freemasons, either way, I didn’t look for anything inside. Actually, I wouldn’t have even if I wanted to, since the building, or at least this side of it from the street, is pretty obscure. They do have their Shield for anyone who would recognize it, but no clear sign stating what the building is in plain English. My flight to London, this time, was through Stansted airport. Stansted is located outside and to the north of London. Quite a bit of distance from London, actually. Certainly when compared to Heathrow airport, which is the one I usually associate with London. It’s possible to get to the city with buses or taxis, but because of the distance this is a far less attractive option and the train service, the Stansted Express, are pretty aggressive in advertising their availability there. I was particularly amused by this huge sign with a very direct message saying “There are 571 traffic lights between here and central London.”, leaving it to the reader to decide that maybe risking standing all those lights (as statistically improbable as it may be) isn’t a good idea. I landed in the morning, and wanted to make the most of the day, so taking the 45 minutes express train seemed like the preferred option. It cost a little bit more, but spending the extra time in London instead of in transit is probably well worth it. Somewhat ahead of me in line stood someone who I was friendly with during my military service. A nice guy, but odd (and coming from me that means something). He was even far worse than I am in the whole social business of keeping in touch with people, so it’s not too surprising we didn’t keep in touch. We got to talk a bit when the queue twisted in a way that brought us right next to each other (across a separator line). Turns out he was there to proceed to some film festival. And this despite him being in university, and the semester actually being in progress. We chatted a little, and exchanged a few pleasantries, but that was that. Right behind me in line were a few woman who I was pretty sure came from my city, though I wasn’t sure if I know them because I saw them long ago in school, or because they’re patients of my father and I saw them in his clinic. We didn’t talk. Further ahead of me in line was someone who looked, and sounded, exactly like a relatively well known Israeli actress, Liora Rivlin. I didn’t cut through the line, shoving people aside, to ask, so I can’t be sure, but there was a very close resemblance. Then I passed customs (Yes, they need those Landing Cards that they give everyone on the plane, and yes, I have to fill in a local address on it, even if I’ll be switching hotels and travelling all the time so the address I give them is essentially only relevant for a single night), bought the train ticket, and proceeded to the train platform. Where the real fun began. I had with me my suitcase, and my carry-on bag. The bag is a shoulder bag, which I’m used to carrying pretty much always. The suitcase I naturally never carry around, and is just for travel. So I stopped on the platform to look at the train routes and stations, to decide where I need to get off. And I left the suitcase for a second to take a pamphlet with the train information. And because the bag was still on my shoulder, everything felt fine, and I went on the train. Without, mind you, noticing that I left the suitcase on the platform. Yes, I’m an idiot. Can’t explain it any other way. About 8-10 minutes after the train left, I noticed that I’m missing my suitcase. I had a quick look around, just to make sure (I changed seats a few times after getting on the train, since it was relatively empty and I wanted to see which was most comfortable), but no luck. This is when all the bad possible scenarios started running through my head. Accompanied by the knowledge that those bad scenarios are actually the likeliest scenarios. One bad scenario which I actually didn’t think about was that someone may have stolen the suitcase. I was more concerned about the security response. Which makes sense, since the chances of station security noticing, or being alerted to, an abandoned suitcase are much larger than the chance that someone who just got off a plane and has taken the train will see a suitcase and decide to take it. As for what station security would do with the suitcase, the only model I had to work with was the Israeli one. That’s the one I’m familiar with. And since the British seemed to claim to be on high alert, especially after a few cases of bombings in the trains and underground, it made sense they’ll have a similar model. Which means that seeing an abandoned suitcase on a train platform, and one in an airport to boot, should make them think it may be a bomb. Around here, they’ll evacuate the platform, and call the bomb squad. Depending on procedure, and on how worried they are, they may close and evacuate large parts of the airport. Major incident, certainly newsworthy. Getting my 15 minutes of fame is fine, but I’d really prefer not to have it as the tourist who temporarily shut down a busy airport because he forgot his suitcase. Not to mention the prospect of losing most of the day in answering questions for pissed off police officers and security people. Not only that, but if they had a really quick response time, and the airport had bomb-squad people on-hand, I may have found that somebody had already tried to put a bullet through the suitcase, or destroy it in some other way. Please make sure your keep your baggage with you at all times and alert staff to any unattended package or bag – abandoned baggage causes security alerts and may be removed and destroyed. I caught the conductor on the train in a hurry, and explained that I left my suitcase on the platform. He asked for a quick description, then called in to the station administrator’s office. The conversation was shorter than I expected. He didn’t start by asking them if they already found a suitcase, or if there’s a problem, or anything. He started off by saying hi to the guy who answered, and directly telling him that he have with him the owner of the green suitcase and is sending him back. They didn’t ask what suitcase he’s talking about, which meant he was right in assuming they already found it. This just made me more worried, since if they already found it then they already had the time to do something about it. Luckily the train had one stop between the airport and London, and I noticed the lack of suitcase a short while before we got there. Otherwise I’d have had to wait all the way to London before being able to return back for my suitcase. As it was the conductor just told me to get off on the station, and pick a train back. The train back wasn’t due for quite a while (A Stansted Express train goes every 15 minutes, but the ones going to the airport don’t always stop at the same stations as the ones coming from the airport), but I approached a station employee who told me I could get back faster by taking another train a few stations back, then switching there for the following express train. This went smoothly, and pretty soon I was back on the train platform in the airport, looking for the station administrator’s office. Wondering if I’m in a huge mess or just a big one, and hoping that my luggage is safe. I reached the location, which was an office with a few uniformed people. One was standing outside the door, and asked me who I was. I replied that I’m the idiot who left his suitcase on the platform (in pretty much these exact words), and waited to see what sort of a welcome I’d get. He told me to hold on, went inside the office, and brought my suitcase out (whole). He asked me if this is it, and I replied that it was. I got a “there you go, bye”, and that was that. No questions, no complaints, no yelling, no nothing. They saw the suitcase standing alone on the platform, and all they did was to bring it in to the office, and wait for someone to come and claim it. On the one hand this is pretty bad security practice. Had the suitcase contained a bomb, or had it been booby trapped, it would have gone off and caught the security people and whatever passengers were nearby. On the other hand I was, naturally, extremely relieved. The whole episode had cost me only an hour of time, and nothing else besides. And a large amount of other passengers didn’t have to have their plans put in disarray just because I’m an idiot. I guess that this sort of thing happens often enough that responding in any other way is really not a cost-effective way to handle forgotten luggage. I got on the next train, double checked that this time all my belongings were with me, and headed on to London. In my previous post I mentioned trying El-Al’s new system of online check-in through the Internet before reaching the airport, the few problems they had with the procedure, and some of the expected benefits. Now I’ve actually taken the flight, and got to experience the results in the airport. The short version is that they get lots of points on intent, but still fail miserably on execution. The first, and most direct, benefit was supposed to be the ability to skip the regular check-in lines. Since people who went through the online procedures already made their seating/food/etc selection, they can use a quicker queue to only send the luggage. That’s the theory anyway. The printed check-in paper had a note stating we need to go to a specific check-in desk (number 78 in this case) instead of the regular check-in desks used for the flight. But the big electronic billboard in the airport, listing the gates for flights, included gate 78 as well. It was right up there on a listing of “All flights” together with a few more general desks. Meaning that we all went to that line, but regular passengers for regular check-in did so as well. In my case, for a example, two people in front of me were this older woman who seemed to have lots and lots of problems, and a younger relative who seemed to have lots of issues of his own. Our line actually became the longest queue at some point, because the few people from online check-in all went there, but other people could distribute themselves based on queue length. One woman behind me on the line even complained quite loudly that she could have saved time by not doing the online check-in. And the sad thing is that she was right. A couple right behind me were there for regular check-in. People tried telling them that this is a line for people who only did the online check-in, but they pointed to the large electronic billboard, and said that this line is good for them as well. And the sad thing is that they were right as well. What’s worse, at some point the woman working at that desk started to almost cry to a supervisor that she’s also taking regular people, and she can’t hold under all that pressure, and that the queue is getting too long, and they have to do something. I would have felt really sorry for her if I weren’t so busy being one of the people annoyed at having to wait so long in the queue that was supposed to be the fastest. Eventually the came up with a temporary solution. They managed to find another clerk to open another desk, and someone arrived to tell us that all the people who did the electronic check-in should go to desk 75 now. This was of course a temporary solution, since all the people who didn’t arrive yet would all still come to desk 78. In the future they should probably just have a different listing for it on the billboard, which they can change in real time. They can’t change printed paper, though. Another point of confusion was that they also recently started with the idea of E-Tickets. Plane tickets that you can print from their site. Which are an entirely different thing from the boarding pass you can print during the online check-in. Except that, naturally, it doesn’t feel that different to people. There were a few who figured that since they printed their tickets online, then they did their online check-in. We moved to desk 75, and gave our luggage to the person operating it. And they gave us a real boarding pass instead of the one printed online. They also verified with us again the seating arrangements and the other details. Which is to say, the procedure took about the same exact time as a regular check-in, since we went through the exact same procedure. Well, not entirely. This was longer. Because of the other benefits that online check-in had, the coupons for a free coffee and a discount at one of the stores. They said that they had to give us a coupon for the coffee. Actually, they asked each and every one of us if we printed the coupon during the check-in, and each and every passenger told them that the printed document did not include a coupon. So we were directed to desk 77 to take a coupon for the coffee. The woman there again asked if I didn’t already had a coupon. At that point I thought maybe the reason for me was that I did it by phone, and the support tech didn’t fax it to me. And that there were other technical problems preventing it being printed for all the other passengers near me. What I didn’t know and, much worse, the El-Al people there didn’t know was that these coupons were not offered for printing at all. I was given a coupon for a free coffee, and went on. I didn’t realize how clueless they all were, so I didn’t think to ask them for a coupon about the 25$ discount at the duty-free sports shop. I assumed that they know their procedure, that the coffee requires a coupon (since it’s hard to track) but that the discount will be given by presenting the printed boarding pass which we all still have. Since they didn’t mention it, but were sure to mention the coffee coupon, this was a reasonable assumption. Reasonable, but wrong. But let’s stick to the coffee for now, before getting back to it. The coupon was for a free coffee at the Arcaffe stand in the duty-free area. The duty free in the new terminal in the Ben-Gurion airport has a central area containing most of the duty-free shops, and a few concourses radiating from it into the gates. Arcaffe has a stand in the central area, so I reached there, and showed them my coupon. And the man there told me that the coupon only applies to the second stand they have on concourse D.
Not that big a problem, since it’s not a long walk (and in that particular case near the gate I’ll have to take anyway), but somewhat annoying. They’re the same network, and should be selling about the same thing, so I can’t see the sense in the separation. Plus, this was not listed on the coupon page. Oh, and if you took a look at that map, notice that the Ben-Gurion airport site has managed to misspell Arcaffe in English. I just saw that, and I must say I’m not impressed. Later on I went to the Arcaffe location on the D concourse, showed them the coupon, and asked what it included. I expected that, as this is a deal/coupon, it will basically be a small cup of a regular coffee, or somesuch. So I was pleasantly surprised. The employee at the shop told me that it covered all the various kinds of coffees they have. And it covered both the smaller sizes and the larger sizes. So this one benefit turned rather very well. Now back to the sports store, which turned out not to be quite as simple. I went to check the store. Now, the deal there was a 25$ discount for any purchase above 100$. Meaning that the coupon is only useful if I actually find something there that I want to buy in those amount. The store contained sports gear (mostly clothing and such), and shoes. Actually it looked a lot more like a shoe store than a sports store. I didn’t need any of their sport gear, but I did manage to find a very nice pair of New Balance shoes which were comfortable and looked good. And since I can actually use another pair of shoes, that was alright. They cost 109$ (Which is the same as the retail price in the US, so is cheaper than the retail price in Israel), which made them a relative bargain at 84$ after the discount. I reached the checkout counter, told the clerk there that I did El-Al’s online check-in so deserve a discount, and showed her the printed (and faxed) boarding pass. She asked for a coupon (You guessed that was coming by now, right?). I told her I was not given a coupon, and was not told that there’s a coupon. I asked if the printed boarding pass isn’t enough as a proof that I did the online check-in. She called a supervisor to ask, and gave the reply that they get the money back from El-Al on the coupons, so as far as they’re concerned the coupons are like money during the purchase, and they can’t go on without it. Very annoying, and something I did not expect. Though maybe, given the state of confusion in other aspects of this check-in experience, I should have. So I asked her to keep the shoes at the counter, and went to find someone from El-Al who could give me my coupon. I went to the information desk, and the guy there said El-Al has a lounge (King David’s Lounge, intended for first-class and business class passengers) with El-Al’s people there which I can try and talk to. I went there, and the woman at the counter sent me one further door outside to their Passenger’s Support counter. In I went, and was greeted by a young man working there (called Yehuda, or Yoav, or somesuch. I asked him later, but forgot to write it down, and the name got a little fuzzy in my memorry). I said that I didn’t get my coupon/voucher for the 25$ at the sports store, and he looked at me quizzically and asked what I was talking about. Turns out that this El-Al employee, which they placed there for passenger support, was not even notified about their online check-in procedure. Not only did he not know about the coupons, he wasn’t even aware they had online check-in. At all. This is a major screw-up from El-Al’s side. I explained to him about it, and showed him the printed boarding pass, and the page saying that doing the online check-in should entitle me to that discount. He checked for some things on his computer, apparently didn’t find anything useful, and called a supervisor. Now, the coffee coupon was a pretty simple thing. Could have been easily reproduced by a home printer, and looked like it has been photocopied. So I expected they’ll just tell him to print a copy of the coupon at his station, and that would be it. No such luck. It requires an “original” coupon (which turned out to be of the same simple-print and photocopied quality. of course). And they didn’t have them in any location inside the duty free. They had to send a stewardess in from outside with it. Meaning that she’ll have to go through all the security check points, and whatever else people have to do to get into the terminal. Not a quick process. Not quick at all, actually. It took over 25 minutes. He told me it would take a while, so I went to do other things in the terminal. But his time estimates were way off, at about 10-15 minutes, so when I came back to ask what’s going on (He did take my phone number and said he’d call me, but I decided to go back and check in person) he still didn’t have anything. Because of the long delay, and the fact that my boarding pass was closing, he went with me back to the store, and tried to ask the saleswoman at the counter if she’ll accept his personal guarantee as an El-Al employee that he’ll give her the coupon later. He showed her his ID and everything. But, as we expected, she said she couldn’t and will require an actual physical coupon. Eventually a stewardess came rushing in. carrying a huge pile of pages with the coupons. He took one, wrote my details on it, handed the page to me, and that was that. At that point there were a few other El-Al employees in the Passenger Support area. They asked what that was about, and he explained it to them. They too never heard that El-Al had this online check-in option. I’m flying for a short business trip abroad soon. The airline, El-Al, has a new feature: allowing passengers to do some of the check-in procedure from home, through the Internet. This has the advantage of possibly saving time if the airport is busy. And it is certainly expected to be busy now, since it’s a holiday season. It also allows to select a meal type (if some special meal, such as vegetarian, gluten-free, etc, is required), and select the seat. Which probably isn’t that big a deal for people going through travel agent, as they can do that in advance as well. But I suppose people arranging flights by themselves, or whose travel agent is lazy, can use that. It also has, for now, a separate station/line for luggage. So until this becomes popular, the lines may be shorter. An advantage which will quickly go away once it becomes more popular, and the lines will even out. Though, still, some of the questions involved with the check-in will be spared, since they were already answered. This isn’t much on a personal basis, since filling it out on the web isn’t much quicker than talking to a person at the station. But it counts on a line, since you don’t also have to wait that time for all the people in front of you. Actually, yes, the advantages are there, but aren’t that big. So for now, since it’s a relatively new service, they’re also offering some minor bonuses for people who use this service (A free cup coffee at one of the airport coffee-shops, and a 25$ discount for purchases over a 100$ in one of the duty-free shops). For them it has the advantage of reducing loads from their people at the check-in counter, so if they can save a salary it should be worth it. I decided to take advantage, and try the new service. The first screen asked for the last name, and the ticket number. In my case an electronic-ticket, also printed through their website. Or, more correctly, printed through their site by my company’s travel agent, and faxed to us. And yes, it’s always amusing to have a printed page containing underlined “click here” links. Somehow clicking on the paper doesn’t help. That went well, and I reached a second screen. This one allowed changing the listed last name (Which I don’t quite get), allowed to enter a frequent-flier number for people who have them, asked for the phone number, and had a long list for meal types. Really long list, compared to what I expected. I guess there are plenty of people with unusual requirements for their meals. Sadly enough there wasn’t an option to choose a non-kosher meal, but that’s not really a surprise given that El-Al is the official Israeli airline, and have to keep kosher. They did, however, have a few meals designated as extra-kosher and such. And I tried to get to the next page. I was greeted with an animation letting me know that the check-in is in progress, and asking me to wait. A message which was shortly replaced by another one, telling me that the online check-in failed, and asking me to call their office (with a phone number). The number was for support on the online check-in, so calling it an office wasn’t exactly right, but never mind. Since I was using Firefox as a browser, and not Internet Explorer, and there are still sites designed badly enough to only work in Explorer, I decided to open explorer and try again. Same error. But the screens along the way looked better. So the site is badly designed, but at least designed to be functional. Functional at the times when it is actually working, that is, which wasn’t the case here. I called the number. A nice girl answered and asked how she can help me. I detailed the problem to her. She asked for the flight details, to check for the flight times. The online check-in option is only valid at a specific time range before the flight, so they probably assume most problems are the result of people trying to do it too early. Though, frankly, if the error message for that is the general error I received, instead of a specific message explaining the problem, then the site is even worse designed than I thought. After checking a little, and seeing that everything should be in order, she said that maybe they are having some temporary problems at their end, and that I should try again a little later. I pressed her for a more exact estimate, of how later is later enough (Not wanting to try later, and talk to them again being told that I did it too soon), and she said to try in about two hours. Two and a half hours later (spares are important) I tried again. Same thing. I called again, and this time it took a while before the call was answered. But the one answering was the exact same girl. Which could be chance, or could be an indication that they don’t have too many people there in the online check-in support department. After explaining to her that the problem didn’t go away, she asked for more details, and said she’ll try to do the check-in from her own station, and will see how it goes. She reached the page with the meal types and phones, put in everything, hit the button to go to the next page, and… after a few seconds I heard her say a very surprised “Oy”, followed by a still surprised statement of “It happened to me too!”. It made me want to say something like “Of course it did, dear. There was nothing I could have done wrong until now to ruin it. It can’t be that I just can’t enter my phone number correctly, is it?” . But she was really nice, and it wasn’t her fault, so I didn’t. She then put me on hold, while she went to check it out. This took quite a while. After getting back, and apologizing for the delay, she said that she managed to do it on her station. I asked what’s the trick, and she told me that they really did had a problem at their end, which they now found and fixed. She also thanked me for reporting the problem to them. This, of course, make me suspect that the system is rarely used so far, or someone else would have stumbled upon it previously. It’s not like I was doing something very unique after all. She then verified with me the seating arrangements. Actually, she quoted a seat number and asked me if that’s alright. It was quite apparent she’s not used to doing check-in with customers. Anyone who isn’t well familiar with the layout of the plane, and I’m not, won’t know what the seat number indicate. Seats numbers on plane are, sadly, not standard. So I just asked her the relevant details, and confirmed that everything is alright. She then finished my online check-in, from her station, printed it, and faxed me the resulting boarding pass. In this case they didn’t really save any manpower by having me do the online check-in. More like a phone-in check-in, actually. One thing which originally surprised me about South Africa was that it wasn’t exactly what I imagined Africa to be. Indeed, as the local people themselves said, SA is one of the most modern countries in Africa, and most place you don’t see the stereotypical sights of animals walking down the streets, reed huts, and such. Bloemfontein was no exception to the rule. It’s mostly quite modern, and most of it could fit perfectly well in Europe or the US. The well known cities in SA are Johannesburg (Usually called Jo’burg by the locals), Cape Town, and perhaps Pretoria. Bloemfontein isn’t that well known, and is very emphatically not a tourist destination. The local airport was nice, but extremely small. There were more than enough things for me to do during my stay there, but with two more free days I would have exhausted it completely, from a visitor’s perspective. Physically it’s at the centre of SA (So no seaport, or sea), but not otherwise. The city itself is not entirely uniform, though, and there are differences between the different neighbourhoods and city areas. Most of my time in the city has been in a place more near the outskirts of the city, an area which was very modern, clean, and gave a very nice atmosphere. While being a part of a big city, the buildings aren’t placed too close together, and the feeling was more like that of a small town than of a big city. The centre of the city was less impressive. The building is still modern, but it has a more urban feeling, with the buildings bunched together more, and far less greenery. The building’s fronts were also maintained far worse, and the streets had some junk thrown around them. Another part of the city I saw was the poor “black neighbourhood”. It had a name, but I’m afraid I forgot it by now. I was also not taken inside, just drove around, since it was apparently not safe for a white person to go inside. This wasn’t a very big part of the city, which is good, but it still looked like a very run-down slum. Temporary houses made of metal sheets, and an incredible amount of junk spread between the houses and around the streets. Not a nice place to visit, and I wouldn’t want to live there. It was located next to a big public hospital, though. But according to my host those public hospitals, while offering free medical care, also offer very bad medical care and hygienic conditions, and not someplace anyone who can pay will go to. I got the strong impression anyone who can afford to uses private medicine in the area, and that this is quite normal and acceptable. The name of the city is in Afrikaans (the local language of the white population), meaning Fountain of Flowers, or somesuch. Which didn’t stop most local people from telling me it’s the City of Roses, and that they’re well known for their roses. Roses which I didn’t see, since it wasn’t the right season. The name, though, was changed a while back (one and a half, or two, years ago. I don’t recall exactly) to Mangaung. If that name sounds strange to anyone familiar with Latin-based languages (which made it easier to make the Bloem=Bloom?=flower, Fontein=Fountain, connections), this is not surprising. The new name isn’t in Afrikaans, but in one of the local languages of the black population (Sesotho?). Apparently this isn’t a unique incident. A lot of places are being renamed in the recent year. One the one hand, the feelings behind this are understandable. The mostly black population has been ruled by the white people for a long time, and this is some way for them to feel a measure of control and that the country is also theirs. But on the other hand I strongly disagree with changing the original names of places which have been called by the same way for so many years (Bloemfontein was founded in 1846). This is disrespectful to the existing history of the place, regardless of whether one likes that history or not. It is also totally confusing, since all records refer to the city by the original name. Not to mention, what was obviously apparent when visiting there, the administrative nightmare. Road signs around the city still refer to it as Bloemfontein, since the cost of replacing them all is extremely high. And it is similar with almost every other reference to the city everywhere. The changes will happen over time, probably, but for now it’s not only that the people still refer call it Bloemfontein, but everything. The first time I realized the city was officially called Mangaung was on my last day, when I saw a welcome to the city sign, and asked what the heck Mangaung was. On the language issue, SA has 11, yes, that’s eleven, official languages. English is one of them, as is Afrikaans, and the rest are a selection of the many languages of the local black population. Sesotho is one as well, naturally. This makes for rather amusing radio stations, or TV news broadcasts, which often go through a wide selection of languages over time. All these languages are official languages of the country, so they have to be supported by public services. The common language, which is not really native for everyone but which, thankfully, everyone knows, is English. Signs are mostly in English, both on the areas of the city I was in, and on the city centre, and even on the slums area I saw (at least on the outside of it). And nobody had a problem switching to talk to me in English once I made it clear I do not understand Afrikaans. Wow, it’s been way too long since my last post. Part of it is due to me taking another trip abroad. A business trip, this time, to South Africa. That doesn’t cover my entire quiet period, but a sizeable week of it. The rest is compromised of both sheer laziness, and some other things I have to do. Anyone knows of a reputable store where I can buy some free time? My company has a client in Bloemfontein, and I have been sent there to help with the installation of a new system. So a few of the days were work, but a few were free time to tour the city and the area. Overall it’s a very nice area, and I had a lot of fun. I will try to do better at posting some of the highlights here, though naturally nothing work-related and without identifying most of the people I saw. I’ve been very lax at reporting about my US trip (oh, yes, need to get back to that as well), but since this one is shorter, and I want to write some of these things anyway, there’s a good chance I’ll actually pull through with it this time. You call that a highway?! The US part of my trip started at Los Angeles, proceeded to San Diego, and ended in San Francisco. A few days were set aside for getting to San Francisco from San Diego, and for stops along the way. We decided to take highway 1, going along the coast. The only real options seemed either 1 or the 101, with 1 being touted as a scenic route. Highway 1 also went near most of the places we wanted to stop at along the way, including Santa Barbara, Solvang (requiring a very small detour), Hearst Castle, Carmel, and Monterey. I’ve been warned that the highways and freeways in the US are of a somewhat different scale than what I’m used to from around here. Driving on the 101, 405, and 5, I could certainly agree with that. Large wide roadswith a sometimes insanely high number of lanes. So when it became the time to get on the Highway 1, I was expecting more of the same. And was in for quite a surprise. For the most part the thing looks like an upgraded dirt road, and even that would be a compliment. A single lane only in each direction, and for the most part the lanes touch each other just like in a regular inner-city street. Heck, most inner-city streets I know are wider than this so called highway. We joined it a little north of LA, in exactly where the map showed the connection. And there were those signs on the side of the road showing that it’s California Highway 1. And still we spent the first part of the drive seriously worried we’re on the wrong road. The word highway carries with it some expectations of size and construction levels which were just not there. I do not expect a highway to have just one narrow lane. I do not expect it to be pitch black at night without any lampposts. I do not expect to have cars going in the opposite direction using the same road. I certainly do not expect such a large number of simple junctions inside it, requiring frequent stops and a constant state of alert on my part for joining vehicles. At many many points, without any apparent change in the road, there would be a sign stating “highway ends” (or was it “freeway ends” ? I’m not sure, but I think highway), followed by a junction, and a “highway begins” sign. Sometimes they didn’t bother with the signs, though. Maybe they know themselves that it’s not a real highway anyway. And all those are what we got on even just the non-scenic parts, before we reached the shore area. Once it became scenic, a few more factors joined the list. Namely, having one border of the road consisting of the face of a cliff, and the other one consisting of a long drop. The so called highway just goes on and on as a narrow (narrow lanes, and no space on the edges of the road at all, except for the occasional shoulder intended to allow a few cars to park. No safety margins at all during driving) mountain road. But it’s still a highway, so nobody thought to maybe lower the speed limit along it. They’re not entirely insane, though, so whenever there was a sharp turn (which is almost every turn, and which happened on average a lot more than even once every kilometre, this is a narrow mountain road after all) there was a sign lowering the speed limit just for it. Yep, that amounts to lots of speed signs, each very localized. And the drivers used to the region, or maybe also drivers with a death wish, or just drivers who aren’t too bright, actually tried to go along at full speed. Not all of them, but more than just a few. So OK, it’s true that normally I never go accidentally out of my lane when driving. But I’m a lot more relaxed knowing that I could if I had to or if it happened, without either smashing my car into a rock or dropping it down a sheer cliff. I tend to drive more carefully under such conditions, and to avoid driving too fast. A few other drivers did so as well. But plenty just went on speeding. There were a few times I stopped in one of the available points with wider road shoulders, just to release the road so these people could overtake me. One lane each direction, I did mention that, right? Worse yet, those parts of the road were full of bicycle riders. By the dozens. A highway lane full of bicycle riders. Followed by cars that couldn’t quite overtake them because they only had one lane, and the road twisted too much for them to have a clear view into the opposite lane to know if it’s going to be free for long enough. You can imagine what that did to the traffic speed on that direction. Which was thankfully on the opposite from ours, so even while I drove slow I didn’t have to slow to the crawl of the speed of a cyclist on a narrow mountain ledge. Keeping the best for last, there was just this one extra factor that really brought all this together to absoloute perfection. Fog. Lots and lots of fog. At points (Though the one advantage of being high, and not directly at sea-level, was that most of the fog stayed down) the road was foggy enough that it was almost impossible to see more than a few meters ahead. This was good since I couldn’t see the drop, but was very bad because there was a drop there and I couldn’t see where. Mind you, we were purposefully taking this road because it’s the scenic route. Never mind that I was too concentrated on staying perfectly inside the lane to pay a lot of attention to the view all the time. But the scenic route was fogged all over. So we couldn’t see the scenery even when we tried, most of the time. There were a few points where we had a clear view, unhindered by fog, and the scenery is indeed beautiful and well worth seeing. But mostly it was just driving on a lousy, narrow road, taken especially so that we could see a view which wasn’t even visible. As seen on a car in a parking in Hollywood. I agree, it’s not all that exciting, but I didn’t expect any Israel flags at all over there, and especially not one on a bumper sticker. The owner is also not a visiting Israeli or anything of the sort, or the only one would have been the Israeli flag, and the US flag wouldn’t have been there. Maybe an American Jew. Maybe a patriotic US citizen who sympathises with Israel. I don’t know. The driver wasn’t there to ask, and frankly I’m not sure I’d have approached just to ask about that anyway. But it was nice to see that, just on a plain bumper sticker, out of the blue. How do you decrease the chances that someone will enter your store to rob the cash register and the safe? That’s a hard question, which I suppose a lot of stores debate. One (or actually, many) of the usual means are security. You can hire security guards. You can put visible cameras that potential robbers know will assist in catching them later. All sorts of mundane stuff like that. The first one is directed at small-time theft. They state that you’re not allowed to enter with bags or backpacks. People are less likely to swipe a few DVD boxes if they can’t quickly hide them. They put it on the same sign forbidding food and drink, which on the one hand are different things since they’re not related to theft but to store cleanliness, but on the other hand this is also meant to prevent damage to inventory so there are similarities. We were inside for a few moments, browsing the collection, and we both carried bags. V might have even had a small backpack. Nobody mentioned anything, and they didn’t seem too troubled by us being inside violating that sign on the door. The second one is directed towards robbery. A sign stating that employees do not have keys to the safe. It tells potential burglars that the money isn’t in a cash register but in a safe. And it also tells them that going inside and threatening the employees won’t do them any good, since they can’t open the safe. Is it true? I don’t know. Someone who work there has to have keys to the safe, otherwise there’s no way to put money in it, or take money out of it. But for someone scoping businesses, trying to decide where to hit, this might serve as a pretty good deterrent. On the chance that it’s true, robbing the place would get only the profits from one day, or maybe not even that. It won’t prevent a robbery, but it would shift it to a different place, which from the store’s perspective is good enough. I’m just a little surprised that an area heavy with tourists is such a risk for robberies. I don’t have any experience in the field whatsoever, but I’d have expected people to attempt and be more low-profile when robbing stores. The things are starting to become more and more popular in public toilets here as well, but we’re not even close to what I saw in my US trip. During the entire three weeks of the trip, there were maybe only two places where the public restrooms included water taps with a handle that needed operating by hand, for example. Practically every single device had those motion detectors, IR sensors, or whatever. You put your hand near the tap, water flows, you take it away and the water stops. You put your hand under the air drier and hot air blows, you take it away, and it stops. Or at least, that’s the theory. One problem I always have with those devices is that a large percentage of them tend to ignore my existence. I’m not very vain, but if I actually put my hand in front of a sensor whose sole purpose is to detect hands, I fully expect that sensor to notice that it’s there. And often enough, they don’t. Requires a whole procedure of moving closer and further from the sensor, changing angles, trying movements in different speeds, and sometimes just leaving and going elsewhere. All things that would not have been required if I had something to push, rotate, pull, or otherwise operate using physical contact. But it some restrooms in the US I encountered a different range of problems. This was with automatic toilets. Ones which are supposed to automatically detect when you’re leaving, and then flush by themselves. And no, I’m not talking about urinals, I’m talking about full fledged toilets. Which are much more complicated, since they should be able to notice when you leave the cell/room, and not just the immediate vicinity. Otherwise they may flush when you’re still there, and haven’t finished. As happened to me more than once. Including a couple that flushed a few times while I was still sitting on them. Darn, that gave me a start the first time it happened. You want to flush when I’m standing in front of you, even though I’m not done yet, that’s fine. Annoying and stupid, but fine. But flushing while someone is still sitting there, that’s just mean. And then there were those few places, only two of them I think, that took automation to a new level. There are two common methods for hand drying in those places, either hot air blowers, or paper dispensers (and those few rotating towel roll things, but there aren’t a lot of them, and they’re semantically like the paper except they get washed instead of thrown). Automatic air blowers are common even here, in addition to those that operate when you press a button. But paper dispensers, the ones I saw, are always always manual. You have to grab a piece of paper and pull. If it’s a paper roll, you pull until you have enough and then you tear it. Simple enough really. Those two places, they had automatic paper dispensers. I was stunned. I reached with my hand to grab the paper and pull, when all of a sudden the roll starts to rotate automatically and the paper slides out. I grabbed the paper, tore a piece, and as soon as my hand was away it stopped going out. That’s so pointless that I’m speechless (apart from the small matter of me having all this to say about it, of course). You still have to grab the paper by hand, and to manually tear it on the serrated edge of the dispenser. So why spew out the paper automatically? What does it save? What’s the benefit? What problem is it supposed to solve? 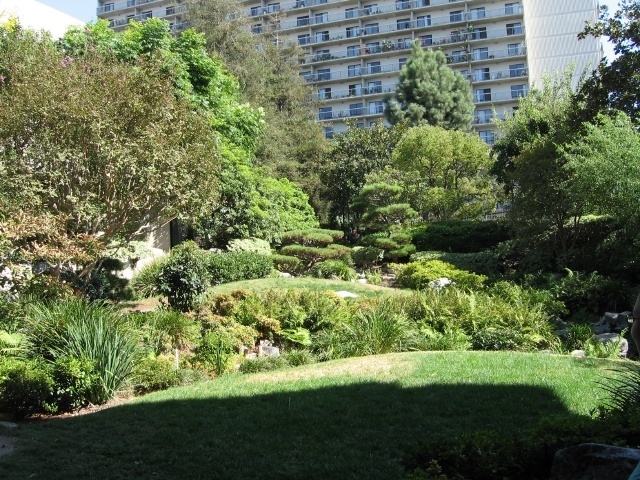 In the previous post we finished with the Japanese gardens in Little Tokyo, Los Angeles, and started to head back to the car. Along the way, us bunch of criminal came along to no less than the LAPD building. Naturally, none of us really care much about the LAPD, or their building. Could be some of them are doing a stellar job, I’m not saying anything against the LA police, just that police departments by definition are not that much of a tourist attraction, right? Generally speaking, if as a tourist you get to know the police too well, it’s a very strong indication you have a problem. But in this case there was a different cause for excitement, mostly on account of V, my partener for the trip. Any of you watches the TV series The Closer? If not, check it out, a really good police drama. Good scripts, except for the pilot episode that had a paper thin mystey. But it’s less a procedural, and more about the main character, Brenda, which is being excellently acted by Kyra Sedgwick. 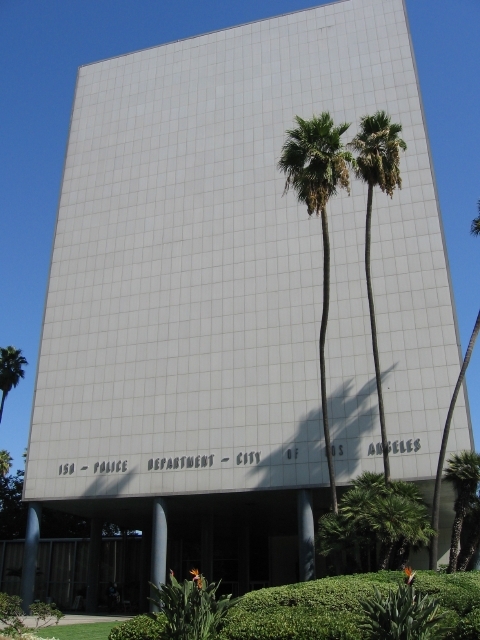 In any case, the series takes place in LA, where their made up Priority Murder investigation unit is located inside the LAPD building, and they show pictures of it sometimes on the series. Surprisingly enough, in real life the building looks exactly like it does on the series. Amazing, eh? So, in any case, police be here. We didn’t wander inside, mind you. And we got another fun legal experience on the way back. 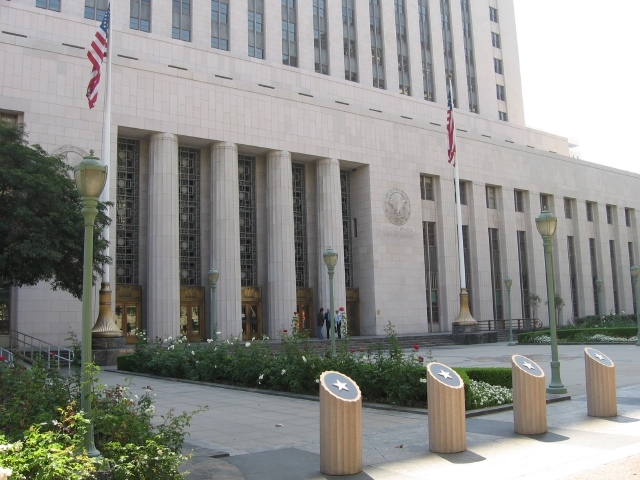 Actually, I can’t remember if it was in front of the LAPD building, or later on in front of the United States Court House. Which is, regardless of whether it was there or not, a big big building. I mean, big. Scary to think how many judges, legal aids, and other people it can contain. Even if some of the space is reserved for actual courts. It’s also very elegant. I guess they think justice should not only be done, but also should be seen. Although, of course, it’s been a long long time since law and justice referred to the exact same things. I mean, that’s what lawyers are for, right? Sometimes to keep the two as far apart as possible. OK, OK, not fair, lawyer jokes. But I’m allowed. So what is the funny event that transpired there, you ask? 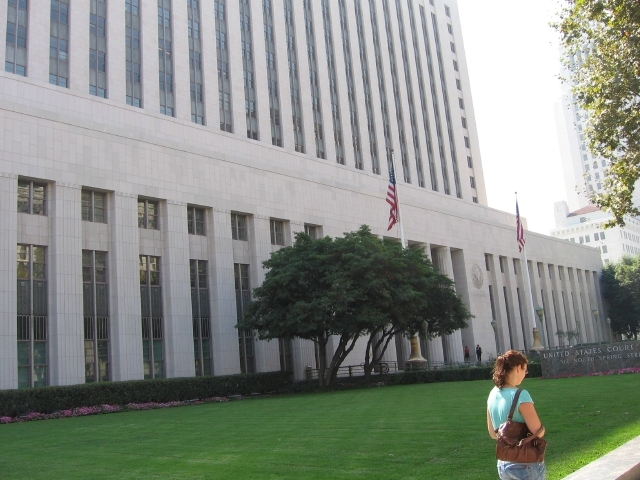 When we were standing there (And thinking about it some more, this was at the LAPD building, not the court house. But hey, the court is nice, so I’ll leave the pictures and narrative here anyway) we got approached by some guy who gave each and every one of us a band/keychain. Taking a look at them, they each had printed on them, in large letters, a phone number for a bail bond company. A 1-800 number, even. It was even more amusing for me, because we don’t really have that whole bail bond concept here. I mean, I think we must have something similar in concept, but you don’t really have those very visible companies offering those services of paying your bail money for you. It’s not a large business like it is in the states. They put people to stand outside the big central police station, and give everyone a phone number for the company. So heck, if we’d have gotten arrested for our crimes , we’ll have an obvious source to turn to when trying to arrange bail. Ha, as if I’d ever do anything so small-scale that a sane judge would allow me to be released on bail. Dream on. We told the guy we’re not getting arrested at the moment. And that we don’t really count on needing bail money any time soon. But he gave them anyway, saying his instructions were to give one to each and every person passing nearby. Cute. Yes, yes, I know, I’m not telling trip stories in order. This is about one week into the trip already, and is my first trip post. Life’s hard. This post covers part of the tour of Little Tokyo in Los Angeles. Little Tokyo being the Japanese district. Interesting (OK, so it’s not very interesting) point, the chinese districts are often called Chinatown, so I wonder why the Japanese are not Japantown, or on the contrary how come the Chinese ones aren’t Little Beijing. When we started in Little Tokyo we wandered around some plazas, looked at the stores, the restaurants, and the people. Actual Japanese looking people. And not only the employees at the stores. Meaning that this Little Tokyo is indeed used by the Japanese descended population, and isn’t just a tourist attraction. Originally we were looking for the Japanese American National Museum (Which will be covered in a different post). After some time of wandering around we striked upon the Little Tokyo Visitor Center, where the nice people explained it was just down the street, and handed us maps of Littly Tokyo (photocopied papers of what was a hand-drawn maps, but still much better than nothing). In addition they had a large map of Little Tokyo on the office’s door, a map which was different than the smaller one and contain many other sites. Sites of which the only one we decided interested us where two Japanese gardens. That’s right, not one, but two. So we decided we have some time before we have to get back to the hotel, and we’ll go compare the gardens. One was inside a hotel, and the other was in the bombastic sounding Japanese American Cultural and Community Center. Thinking about it, we figured the one in the cultural center is bound to be more impressive and authentic, so off we went to go and see it. On the way we passed a square having what claimed to be (No, we did not speak to it. Inanimate objects do not speak, and if they speak to you then you should go consult a psychiatric. There was a sign. ) 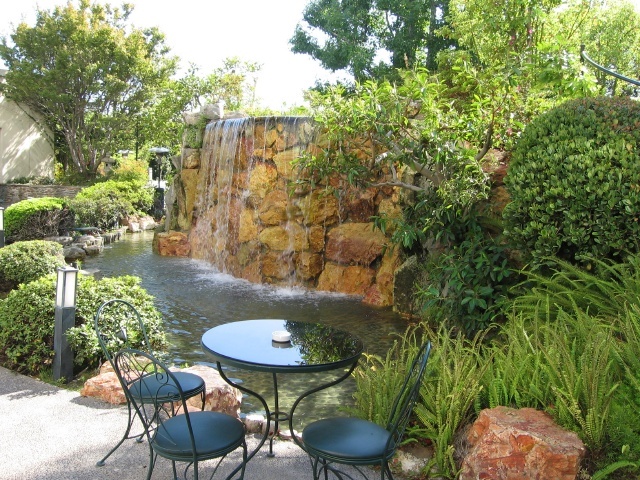 a Japanese stone garden. Consisting of a raised platform with four (Or was it five? My memory is playing tricks on me…) large pieces of rocks. 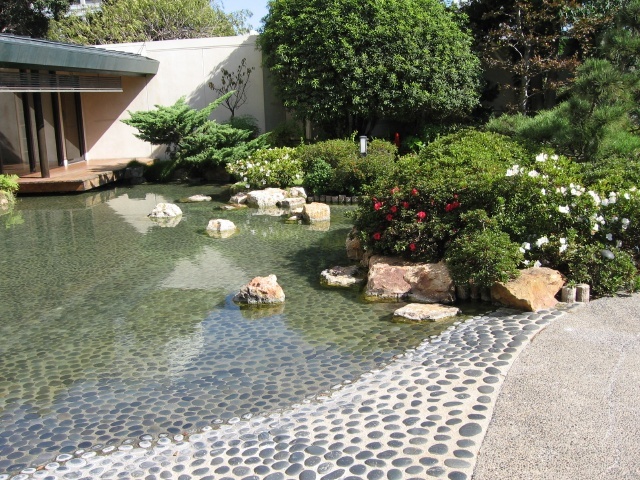 I saw better Japanese stone gardens in construction sites. Blah. 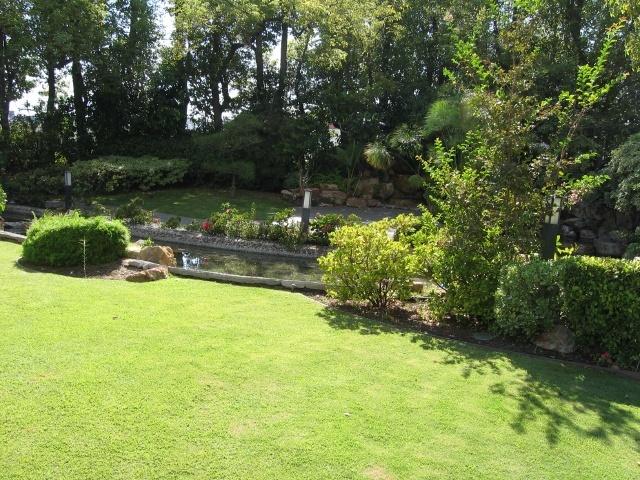 So onward we went, to see the magnificent garden. The best that the Japanese American Cultural and Community Center could provide. And let me tell you, we were not impressed. Small, I can understand. Though it was really small. But small is fine. Small wasn’t the problem. Being dry and half dead was the problem. There was a nice stream there, except no water flowed in it. Not a drop. Some of the flora was dry as well. We took a look around, but the sounds we made were more of disappointment and derision than of awe. 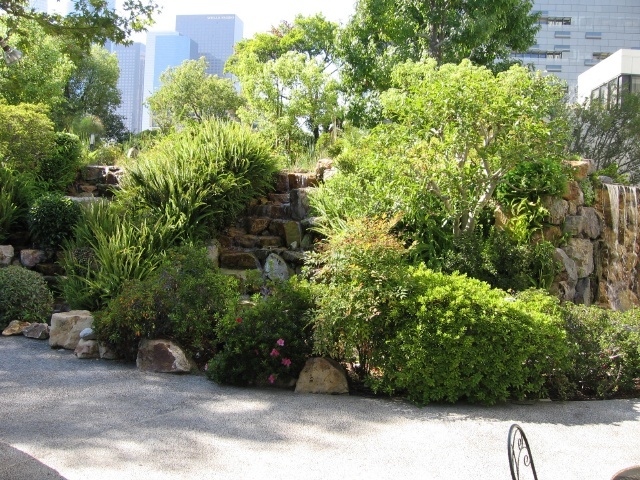 Especially considering that The James Irvine Garden, as this garden was called (I think after a guy named Irvine, just a hunch on my part), had a few plaques stating that it received some lofty award. We thought there may be more, and decided to try entering the centre and asking. Well, we did enter, from the only visible door on the garden. Which got us into a corridor full of closed rooms, and one open room where a few old Japanese guys were playing some board game (Looked like chess, but I wasn’t looking closely. Could have just as well been Go or something else more stereotypical). The corridor ended in an elevator, and all without any signs, directions, or offices. At that point we became bright enough to realize we have nothing more to look for over there, and went out. Onward (Two block back, and one to the side, but semantically speaking it’s onward, especially since it was the right side to get back to the car) we went, to the garden in the New Otani hotel. Opinions were divided on whether it would be even worse, since it’s just a hotel, or better, since it’s a hotel as so has funding and can’t afford to disappoint guests. 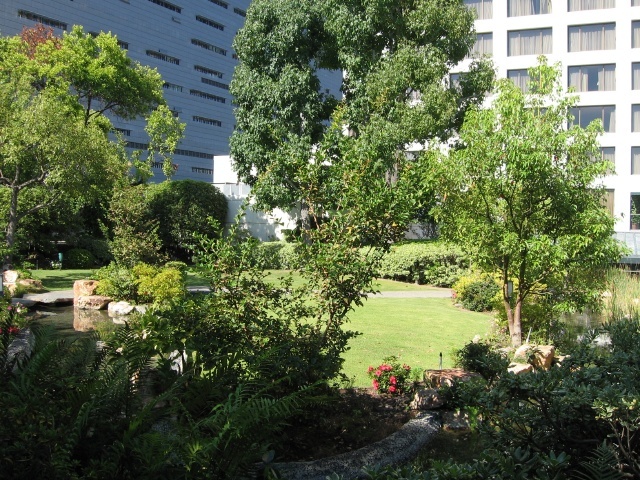 We went over, and saw just walls of the large and tall hotel building, no garden entrance. We entered, and asked the front desk (Or was that another employee of the hotel standing in the lobby? Darn, my poor memory, it has only been a few weeks). We got directed to… the elevator. Which had a button for the garden level. Just press the G button, like most other places have for Ground floor. It means Garden here. Very intuitive, eh? And the elevator went… up. 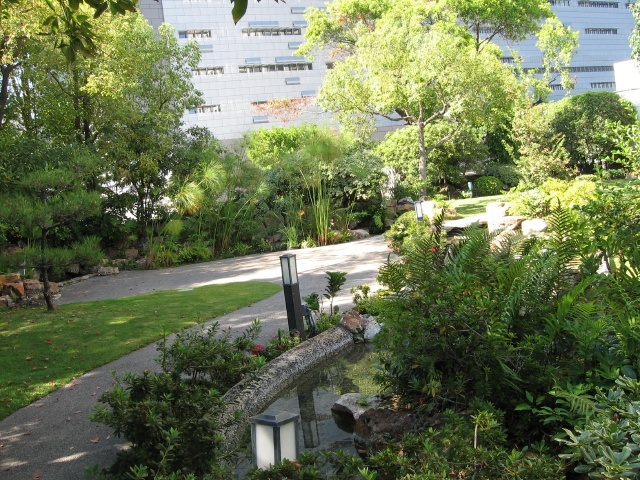 The garden is high up, on a roof of the building, with a view over the street and the rooftops of some smaller buildings nearby. And it was much much prettier. And bigger. We wandered around a bit (just a bit, it was bigger, but not that big), took pictures, and left. 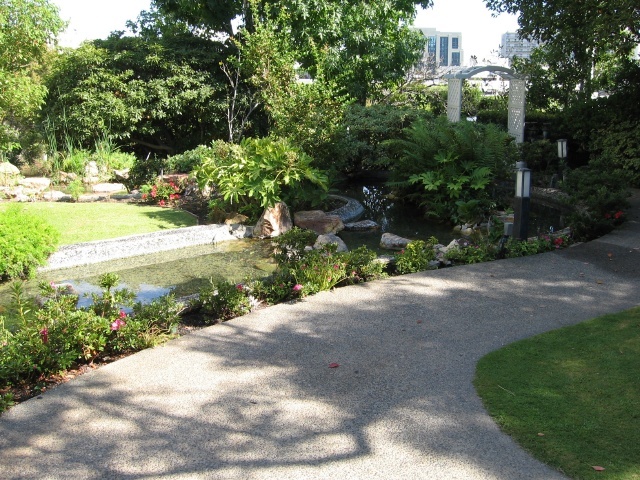 Of course, this was America, so we noticed the traditional peace and harmony of the garden are used on evenings for something as Japanese and peaceful as… a pub. Beer on the garden, people, yay! Mind you, this was not evening, and there was no beer. So we left the garden, and left Little Tokyo. I have just returned from a long trip. Well, just three and a half weeks or so, but since I don’t realy travel that much, it’s very long for me. This one had a little bit of London, and a lot of California. Various stories, events, and impressions (and a few pictures, probably) will appear here in the near, and not so near, future. But after that long an abscence, I’m not really counting on having a lot of time to post everything just yet. So this post is just to say that… I’m back.